October is the most beautiful month to be in USA . Period. Just before nature inflicts the arctic temperatures of winter, she briefly gives us a glimpse of her power to create beautiful weather. And this year she has positively excelled in it. We went on a hurried trip to Vermont , where you normally get some of the best views of the spectacular colors of the fall season. It was a long drive, almost 10 hours to reach our rest area for the night, a very charming cottage in the town of Williamstown , near the Massachusetts- Vermont border. 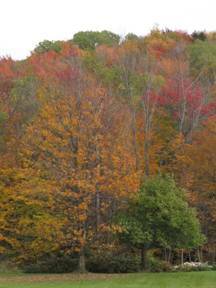 The next morning, we went on a drive along the Green Mountains of Vermont, agape at the vivid colors of nature. 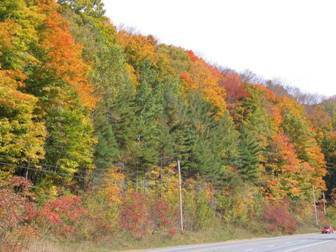 Bright yellow, red, pinks and purple colored trees, lined every road, every highway. In the midst there were the evergreens, with their green color lest we forget what the original green color of the trees looked like. Each tree seemed to have selected its favorite shade and then draped itself in multicolored hues of that color. Some ambitious trees, even had two or three different colored leaves. The other pretty sights were a few covered bridges that we saw on our way, including what was touted as the longest double span covered bridge in the world. The bridge spanned the Connecticut river dividing Vermont from New Hampshire , where we stepped for a minute to take a few photographs. There were also numerous pick your own pumpkin farms with pumpkins of all colors and sizes in almost every field as America gets ready for one of its popular holidays: Halloween.